Food consumers across the world—from North Carolina to Nairobi, from Kiev to Kathmandu—are expected to number 9 billion in 2050. And right now, around 795 million don’t have enough food to lead healthy, active lives. To feed this future, there’s an urgent need to find new, long-term solutions. Fortunately, a good idea can come from anywhere. That’s one of the driving concepts behind a unique partnership between Land O’Lakes International Development and the U.S. Agency for International Development. The Feed the Future Kenya Innovation Engine, part of the U.S. government’s global hunger and food security initiative, funds new ideas that are — quite literally — changing local agricultural landscapes. Here’s how it works: Innovators — small business owners, farmers, and technical experts from Kenya — submit their ideas in an open competition. The winners receive the funding and support necessary to make their solutions happen. Take the potato, for example. This humble root vegetable is Kenya’s second-most important food crop, but common problems like poor seed quality, credit risk, and bad environmental conditions are preventing farmers from realizing their full potential. These factors not only impact farmers’ economic situations — they also affect the nutritional value of the food available in Kenya. An innovative approach, dubbed Viazi Power (“viazi is Swahili for potato), is a new “fusion-farming” technology that’s aimed at boosting productivity. Created by Richard Stonewigg, the founder of a Kenya-based agricultural inputs supplier, the unique farming approach targets seeds and roots with a new treatment to help potatoes grow in adverse conditions. Over the course of two years, the Viazi Power project recruited and trained nearly 6,200 farmers, and developed a sustainable supply chain for the new treatment product. The results? Farmers reported bumper crops of more than double their usual yields. By investing in ideas from people like Richard — a 30-year veteran of technical development and crop nutrition — Land O’Lakes and USAID are helping to build a better, more prosperous world, one farmer at a time. Much farther south in Africa, in the tiny Kingdom of Lesotho (it’s about the size of Maryland), more than three-quarters of the population depend on agricultural production for their livelihoods. However, during the rainy season, fertile land is washed away, ruining grazing land, roads, and farms. As a result, just 9 percent of the nation’s land is arable — down from 13 percent in 1980. That’s not a lot of farmland to support Lesotho’s need for food, so around 70 percent of staple crops have to be imported. 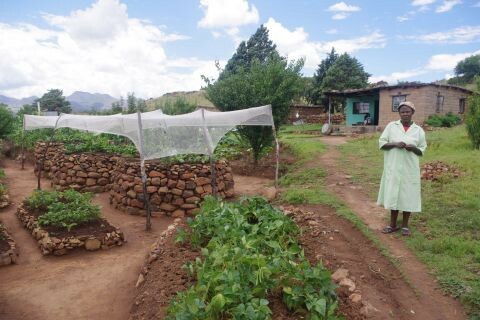 International non-profit World Vision’s program in Lesotho aims to preserve and rehabilitate this valuable land, employing a unique tool to tackle food production: keyhole gardens. The Keyhole Garden program is funded by USAID’s Food for Peace, which works to reduce hunger and malnutrition, tackle the root causes of food insecurity, and give people the tools they need to weather future disasters. Founded in 1960 by President Eisenhower, the ultimate goal is to lay the foundation for a future where no one needs food assistance. On-the-ground program implementers World Vision, along with CARE and Catholic Relief Services, targeted households affected by HIV and AIDS — those most vulnerable to an insecure supply of food due to land degradation, erratic rainfall, and weather extremes. What exactly is a keyhole garden? This raised-bed structure uses recycled materials and requires minimal water, since it’s built to retain moisture and boost the nutritional value of the soil even during dry and cold months. As a result, these gardens are much more productive than conventional gardens and are able to produce vegetables year-round. The structures were also designed to provide easy access, since they’re raised off the ground, and require little maintenance, which allows the chronically ill and the elderly to tend them more easily. 59-year-old Masembakaleng Kabane is HIV-positive, and having enough to eat — especially when it comes to nutritious, fresh vegetables — allows her to take her medication properly and provide for her children. With the extra money from a good harvest, she’s able to purchase school supplies and other household necessities for her family of nine (among them, a niece, and four orphans). Now, neighbors come not only to buy her vegetables, but also to learn how to manage their own keyhole gardens. Success stories like these aren’t isolated anecdotes. Programs around the world — partnerships between the U.S. government and NGOs — are making a huge impact, building resilience and helping communities plan for the future. Whether it’s building roads and irrigation systems in Myanmar, planting drought-resistant trees to boost soil quality in Uganda, or adapting new mobile technologies to open up access crop planting information, families, communities, counties and nations are being empowered to lift themselves up and break the cycle of poverty and hunger. Because of organizations like Land O’Lakes, World Vision, and so many others who actively work alongside our nation’s humanitarian workers to improve the livelihoods of people around the world, Americans are helping to achieve a better, safer world. And that’s in all of our interests. Land O’Lakes and World Vision are USGLC coalition members and partners for the 2016 Tribute Dinner honoring Secretary Tom Vilsack and Congressman Mike Rogers for their support of U.S. global development and diplomacy. Photos: Farming family/USAID; Viazi Power potatoes, freshly harvested/Feed the Future Kenya Innovation Engine; Masembakealeng Kabane with her keyhole gardens/World Vision.